Ana lives in Mololoa a community on the outskirts of Tegucigalpa. She lives with her husband, 73 year old mother and 4 children. In 2014 Ana signed up for the Mi Esperanza sewing course that was being offered in the community center in her village. Ana was a great student and made a lasting impression on our instructor. Before learning to sew Ana did not have any marketable skills and therefore did not work. She did however volunteer with World Vision in her community. As much as she liked giving her time to a worthy cause that helped her village she dreamt of being able to financially contribute to her family, her children's education, and to have resources to better care for disabled 16 year old daughter. With that ambition in her heart Ana completed the Mi Esperanza sewing course hoping it would open doors for her to find work. Not long after her graduation the MI Esperanza production house needed some temporary workers for a large production order. Because she excelled in her class work our sewing teacher called her to work on the job. She began as a temporary employee but quickly worked herself into a full time position with her dedication and sweet spirit. With a donation from Mi Esperanza of a sewing machine Ana also works from home. Now Ana has reached the goals she set for herself. All of her earnings go toward her the care of her disabled daughter and her other 3 children's educations. Nery is a 15 single girl who lives in the community of Jiniguare, a long trek into the mountains beyond Santa Ana, Honduras. Nery heard of Mi Esperanza's free sewing training course being offered in Santa Ana from a friend. She walked one hour to find the course and when she did she signed up for the course. Nery knew this was her only opportunity to learn a skill and for seven months she walked one hour to class and one hour home 4 days a week to take advantage of this opportunity. Nery 2014. Receiving her sewing machine she was awarded for excellence in class. At graduation Nery was recognized as the top student of her class for her commitment, dedication and hard work. For that honor she was awarded a sewing machine to use in her home. 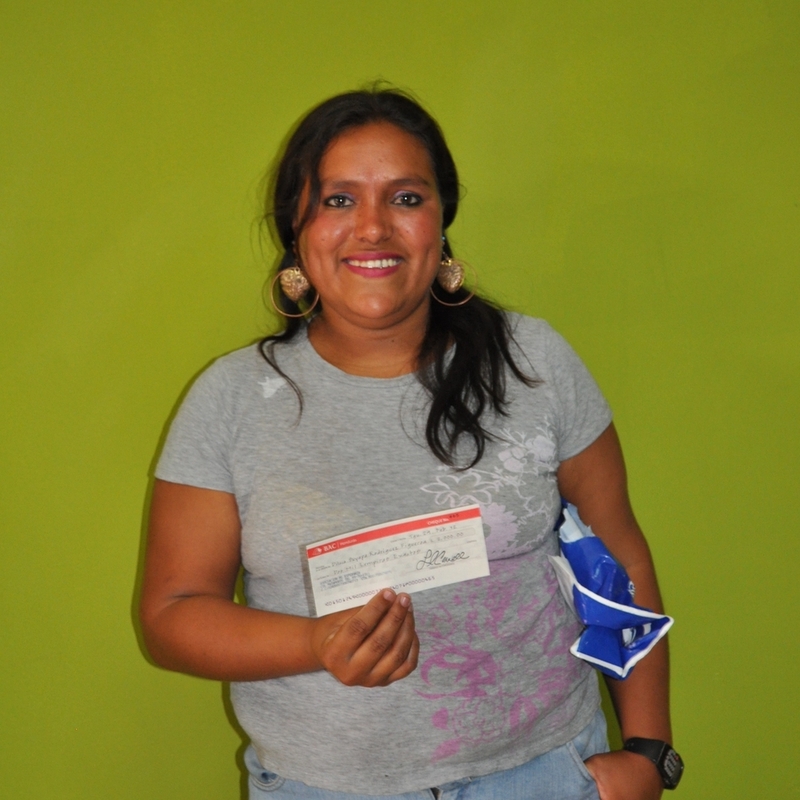 Nery is so happy with her education and receiving the machine because it will be a new source of income for her family. Mercedes came to us by recommendation of a friend from church. Mercedes was going through a very hard time in life and struggling with depression. She was not working and living in despair. Her friend convinced her to call and sign up for the course and she began class in August 2013. Mercedes was dedicated to the commitment she made in receiving one of the chairs in the class. As she learned she found her outlook on life began to change she had a new sense of HOPE and enjoyed her time at class and the people surrounding her at Mi Esperanza. When she started she did not know how to turn a computer on, now she knows how to use a computer and all the programs presented in the course. Mercedes was known in class for her punctuality to class and responsibility in her work. One month after she graduated she had an opportunity for work as a promoter of sales for Grupo Cooperativo Excelsior International. She applied and received the job. She creates reports in word and documents in excels and these are both skills she learned during her course at Mi Esperanza. We are very happy for Mercedes and ALL it offered to her life because no one should live without HOPE. 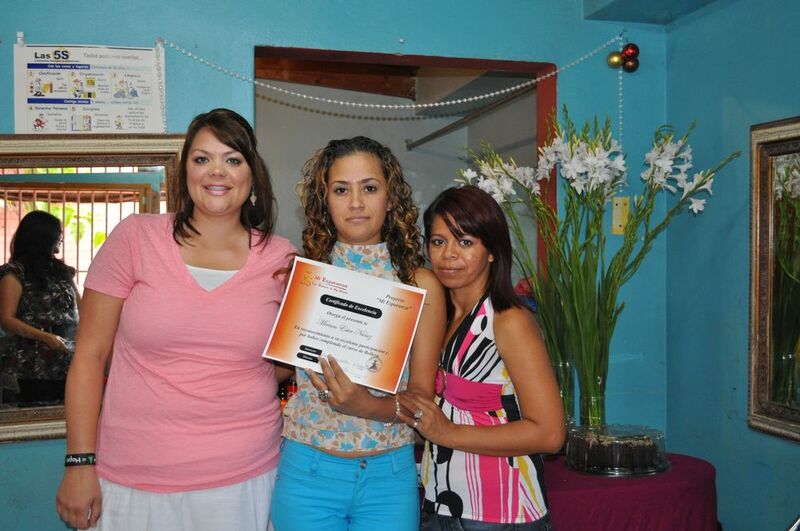 Martha graduated from the Mi Esperanza beauty school in August of 2012. Since her graduation Martha has been employed by Hefziba Beauty Salon where she preformed her internship, a requirement for graduation. Martha is very happy with her job and enjoys the environment in which she works. She thankful continues to learn and gain confidence in the beauty industry. Martha's boss is also very pleased with the work and ethic Martha has. She is very proud of her perseverance and commitment to her work. Martha is thankful to Mi Esperanza for the education and skills she now has to help support her family. I met Lori, Mark and Janet in 2007 when they were announcing the Mi Esperanza courses in Nueva Oriental. I heard Mi Esperanza was offering Computer, Cosmetology and Sewing class to women of low income. I was really interested in the sewing course and I decided to take it immediately. The next year after I graduated my husband died, when Mi Esperanza found out about my husband, they called me to offered me a current job that was available at Mi Esperanza, which I happily accepted. I feel good to be part of their team. I started working from Monday-Thursday, but thank God we have had so many new projects that I work Monday-Friday now. I have had many good experiences working with Liz Alig making garments out of recycled t-shirts. I got to meet E.A and make her wedding dress, the groom's suit, bridesmaids dresses and groomsmen suits. It is good to know that the products I make are sold in the states which mean we are growing rapidly as an organization, and the effort I do is not in vain. That is the reason I try to do better every day. 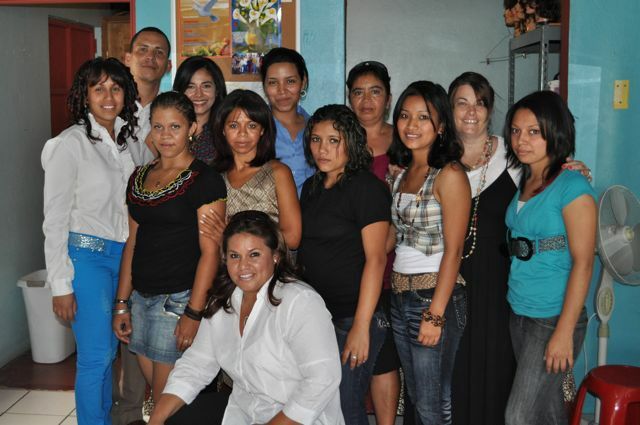 I have also had the opportunity to participate in Mi Esperanza's micro-loan program. In Honduras there are not many jobs available for women and that is why I thank God for Mi Esperanza for giving me the opportunity to be part of this wonderful project. I like the fact that there is not discrimination because of my age, but pure affection and motivation toward me from the staff. Through these seven years I have felt the emotional, economic and moral support. I feel at home every day that I work at Mi Esperanza. I have had so many benefits and gifts from Mi Esperanza, I have received a sewing machine that I use to work at home sometimes, fabrics, school supplies and food, When my son had an accident he could barely walk and Lori gave me a pair of clutches for him, that was so nice of her. But the most important thing is that they gave me was the sewing course to learn how to sew. Because of it I am able to work for Mi Esperanza. I have skills now and I have a job that helps me provide for my family. I heard of Mi Esperanza back in 2006 when our preacher told us about the courses Mi Esperanza was offering to poor women. I took the reed weaving and piñata making course. After graduating I appled for a seamstress job at Mi Esperanza, and they were kind to give me a job in the maquila. I was doing very good making enough money to support my family, but my husband had an accident that left him physically incapacitated. I had to quit my job, to take care of my husband. During this difficult moment of my life, Mi Esperanza always helped me emotionally and they gave me a wheel chair and a handicapped bed for my husband to help me care for him better. After a year of taking care of my husband I returned to work at the Mi Esperanza maquila, I don’t know what It would be like without Mi Esperanza helping me and providing me a job. Because of this job I am able to support my family and give my kids the education they need. I have been very busy working on several projects, I love making school uniforms for kids, and bags for the ladies that come visit us every summer, I am so happy to know that they love the product that we make in the maquila. One of my favorite bag is the misquito bag. I love the fact that these "school" bags helped the kids that live in isolated parts of Honduras. I will always be grateful to God and to Mi Esperanza, I wish there were more organization like Mi Esperanza in Honduras! During the two years Glenda attended class she was eager to learn the skill of sewing. Sometimes it was hard for her to go to class because she had to prepare for her children to go to school and have lunch ready for her husband, but with effort and perseverance she finally obtain a diploma. At graduation Glenda received a sewing machine from Mi Esperanza and immediately told her friends that she was opening a sewing business. Currently she is sewing school uniforms, skirts or whatever the her clients need. With her knew skill she is able to provide extra income to help with household expenses and buy school supplies for her children. The Santa Ana work group for the Winterfest project. Glenda receiving a sewing machine at graduation as one of the top students. Glenda with her children and diploma. Pride for the whole family! Family home. Look at that view! Glenda at work in her home business. Six years ago Onyeda graduated from Mi Esperanza and since then her live has taken on a whole new reflection. Onyeda has been working at the same salon since her graduation. After graduation she was hired at Ivonne’s Salon on Blvd. La Hacienda in the capital city of Tegucigalpa. 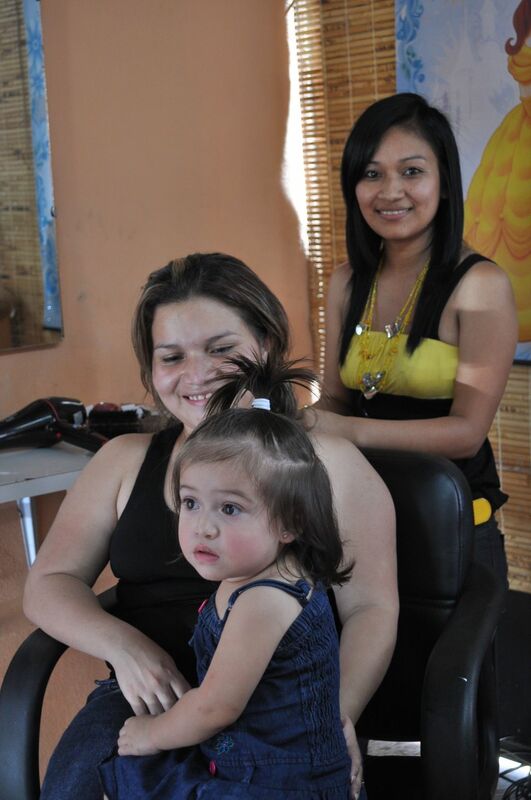 Yvonne's is one of the leading salons in Tegucigalpa. 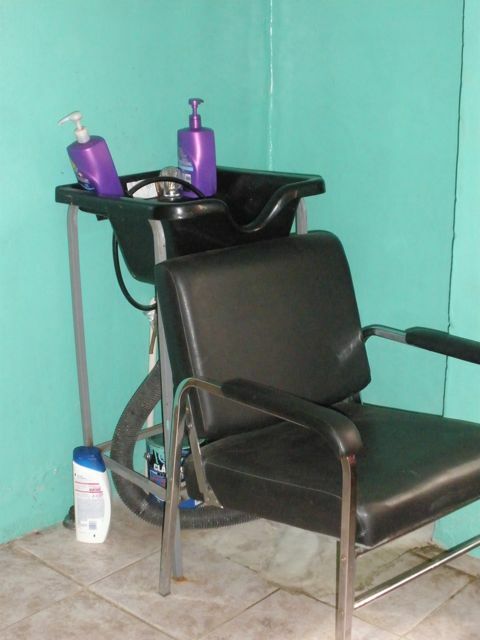 Onyeda performs all levels of service within the salon and has built a success cliental. When Onyeda graduated she did not have any children but now has a daughter who just entered school and is pregnant with her 2nd child. Oyneda says that her ability to work has lifted a financial burden within her family. Being able to help her husband financially makes her happy and eliminates a lot of stress for all of them. Onyeda thanks Mi Esperanza for giving her an opportunity to gain an education that is she is using everyday. Onyeda on graduation day. Pictured with Leo and Gena. Ledy lives in Nueva Oriental in a "Torch Mission" house. She has 2 daughters and is a Mi Esperanza graduate. Ledy graduated from our sewing program in 2007. On Saturday we visited with Ledy to see how she was doing and get an update on her life. We are happy to report that she is doing great and using the skill that she learned from her training at Mi Esperanza. She has a sewing machine in her home and works for private clients making clothes. 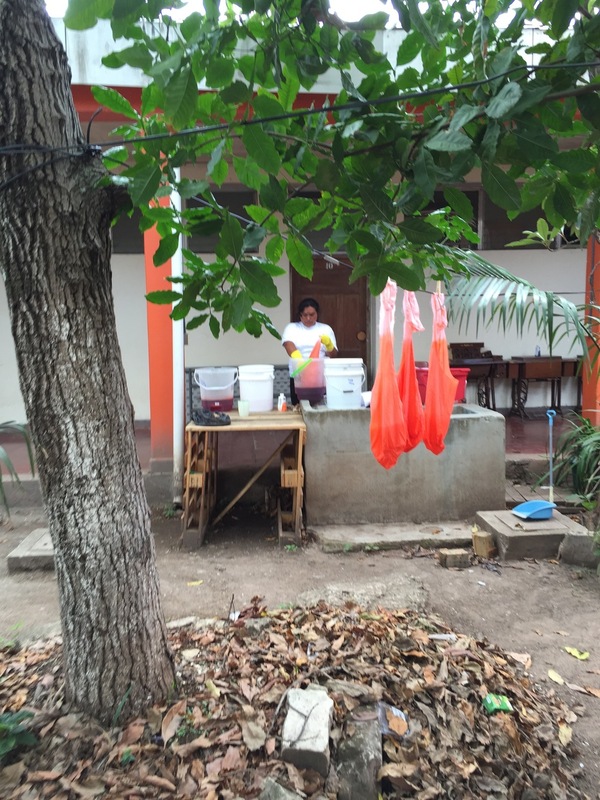 She has also been working in a maquila since her graduation where she makes t-shirts and blouses. 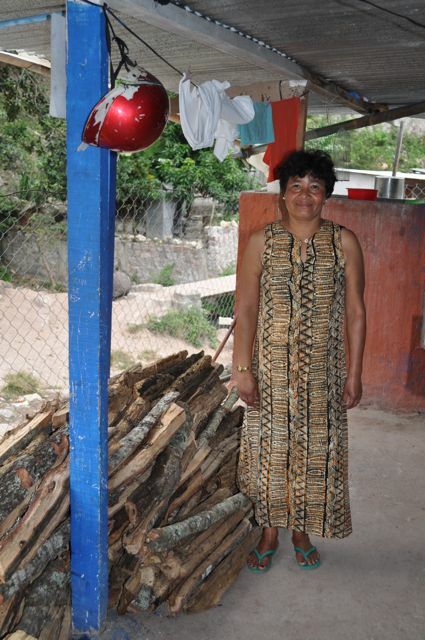 She has been able to add a room on to her home, put in a concrete floor and add a large pila to her house. Her daughters are healthy, happy and in school. Ledy shared with us how her education with Mi Esperanza has provided stability for her and her family that would not have been possible without the education she received. She has consistent work that provides daily needs like food, water, shelter, medical care and education for her daughters. 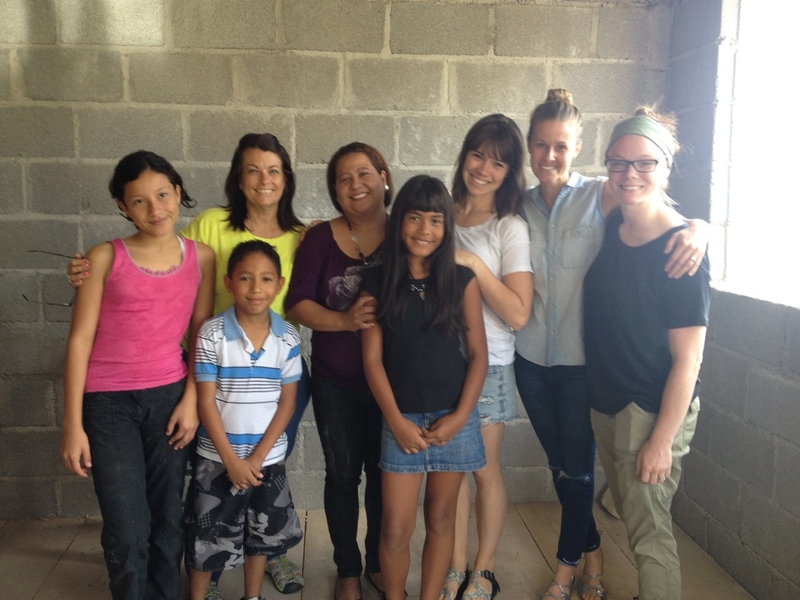 Another Mi Esperanza success story! Ledy is in nursing school! This is a dream she has had since she was a girl. The opportunities she has/had with Mi Esperanza; education and employment are making this dream come true. Yesterday's visit to the home of Ledye Martinez was beyond inspiring and a blessing. All of her children came running when we arrived in the village, you see their momma was home 2 1/2 hours early because she didn't have 3 hours of bus rides to get home from her work at Mi Esperanza. Ledye and her family are doing amazing and she is open to share that her education with and work for Mi Esperanza continues to move her family out of the cycle of poverty. In Dec. Ledye herself finally graduated high school and she is very proud and her children beam with pride for her. She would like to go on to nursing school but will have to save to be able to take her entry exam, but it is her next goal to be reached, as she said "university is very expensive for someone like me but little by little it will be done" As we looked around we couldn't help but notice the wall displaying all the education diplomas of the entire family..a high priority in this home. And as we sat and visited, there was evidence of the life changing things we know about educating women; All of her children are attending school, her home with each visit improves and her children are healthy, happy and well fed. These markers tell us that the work of Mi Esperanza is on target with our goal to break the cycle of poverty in the lives of women and change the future for children. Ledy continues to work as production manager for Lizalig and is excited to begin a new assignment with our newest partner in hope Petit Peony. Ledy has become the production manager for our partner in Hope Lizalig. She oversees all aspects of the bi annually production. She is known for attention to detail and ethics in her work...we so beyond happy for her to be recognized in this way. Jensy Paola Espinal Martínez was one of the top students in her class excelling in all areas of training. Since graduation she has begun a beauty project in a small section of her house. 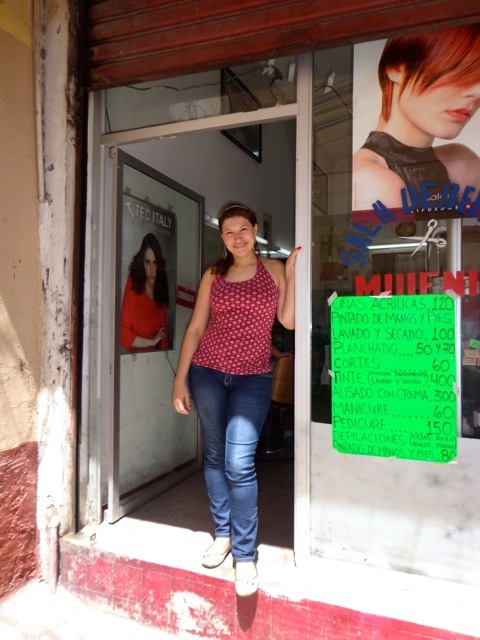 Her goal this year is to officially get the operating permit to open a "salon" her salon's name will be PAHO-PAHO. In the meantime, friends, family and neighbors call her for her services, haircuts, Manis and Pedis. Paloa has big visions for her future, she would like to someday own and run a salon in the capital city. She would feel very proud if her story can serve as an inspiration for other girls. We are excited to watch Paola's progress with her beauty salon. Paola recently received recognition by a professional hair product company as an official salon of sales of their products. She is official! Paola's salon is registered and recognized my the government! Paola's new car she purchased with a micro loan through Mi Esperanza to help her move from her salon to Mi Esperanza for teaching. We were able to bring Paola some products she can use in her salon, she was very thankful! On a recent visit to Pao-Pao salon Paola was proud to show us she had updated the ceiling in her salon with new tiles. She was also recently recognized by "Tech Italy" as an official selling site of their products. Congratulations Paola! Paola has successfully registered her salon Pao-Pao with the government. She continues to make upgrades and improvements to her business. She is now working on obtaining her visa to the USA so she can travel for further education and to purchase supplies for her business. This summer Paola provided spa nights to TORCH volunteers to earn the funds for the cost of processing her visa. We are so proud of Paola and her hard work! Paola has joined the Mi Esperanza staff! Paola is now our beauty instructor, she just began her second session of classes in our new salon class room. Her salon is doing great and she schedules her teaching job around her salon hours. She recently bought a car with a Micro-loan from Mi Esperanza so that she can move more effectively between the 2 jobs as well as she travels to clients home with her salon business. She paid her loan back in full in 6 months! Paola is doing fantastic! Her business is growing and she meeting all the goals she has set for herself! During our recent visit Paola was excited to show us her new tile floor. If you remember from our last update she was saving for her floor....SHE DID IT! Her next goal is to complete all of the legal paper work on the salon and officially name her salon.PAO PAO (Pow Pow) We love the name don't you? Paola is always gracious to provide services while we are visiting..this time she gave Lori and Gina a "hair cocktail" a conditioning treatment. Lori also got a much needed trim, she did a great job! Visiting with Paola is always a joy. She is positive, up beat and optimistic for the future. Paola also agreed to offer her salon as location for Mi Esperanza students to fulfill their internship. We cannot think of a better example for our students! We got a call from Paola this week because she wanted to share with us her most recent success. After the christmas busy season in her salon she was able to buy the tile for her salon floor. She was very excited and proud and wanted to us to know. She is now saving for the rest of the materials and labor costs so she can have the floor installed. Celebrating the one year anniversary of her salon "Paho Paho" Paola invited Lori and Gina in for a celapon hair treatment to say thank you to Mi Esperanza for helping her reach a very big dream in her life. Lori and Gina had a wonderful time catching up with Paola and seeing how she has grown her business in the past year. It was easy to see that she had been busy. Since our last visit Paola has added a hair washing sink, shelving, a product display case and painted her salon. She now offers color services to her clients. This past year she helped 8 brides with their big day and now travels to 3 communities for clients in different areas of the city. Gina and Lori visited Paola in her newly established salon in the garage of her family home. When they arrived she was servicing a regular client with a manicure. Paola says weekends are her busiest days of the week and building a consistent client base. Her salon is small but she says this is only the beginning! She is grateful for the education that Mi Esperanza provided her and the opportunity that it has offered her. Paola is staying actively involved with the Mi Esperanza program as she hopes to be an inspiration to others and want to give back to the program that helped her.